These Tiles were Replaced by another company. 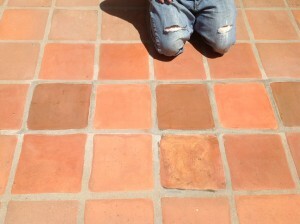 As you can see, the tiles have no color on them and the shape & size were real close. They thought they were Lincoln Pavers but they were actually Tecate Pavers. 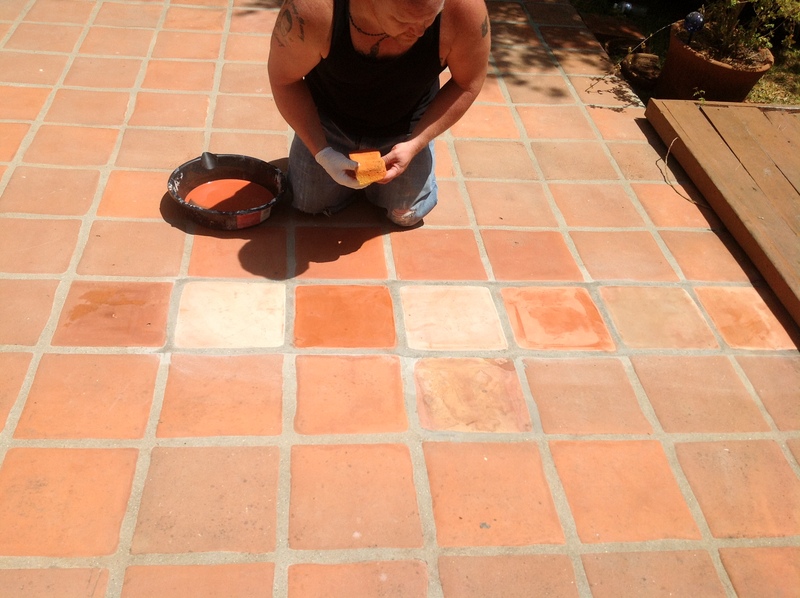 As you can see in the pic, I stained one tile a brown color, and the other Lincoln Paver a red Terracotta color. 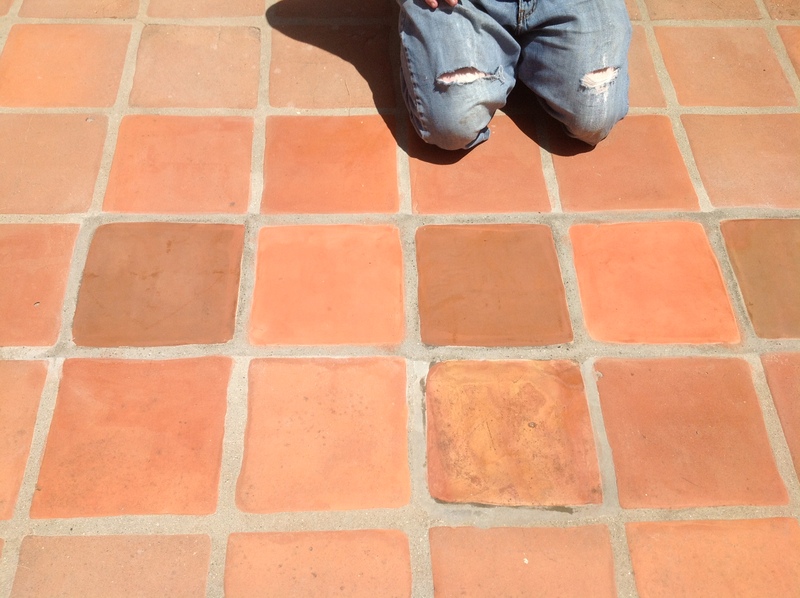 These were my test colors that I custom Made to match, or blend into these older pre-existing pavers. In this pic were just about done with the terracotta color, getting ready to use the brown stain. Wrapping up the brown staining. 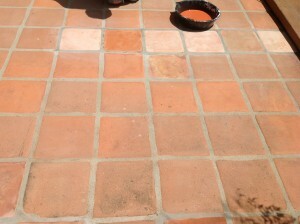 The yellow and red one in front of the second brown tile im in front of, is a saltillo! It does not match the lincolns or tecates at all but it was there from some previous tile replacement. California Tile Restoration has just showed you five tiles blended with stain to match the existing Pavers. Out of the 50 tiles that we actually blended, we only showed you five so you have a good idea of the different challenges that we come accross on a day to day bases. 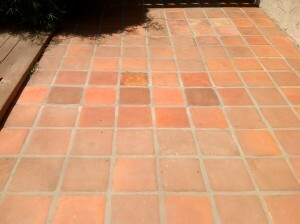 Final Pic of Lincoln Pavers Patio in Downtown San Diego California, just a few miles from the airport. The whole time here we heard airplanes back to back. 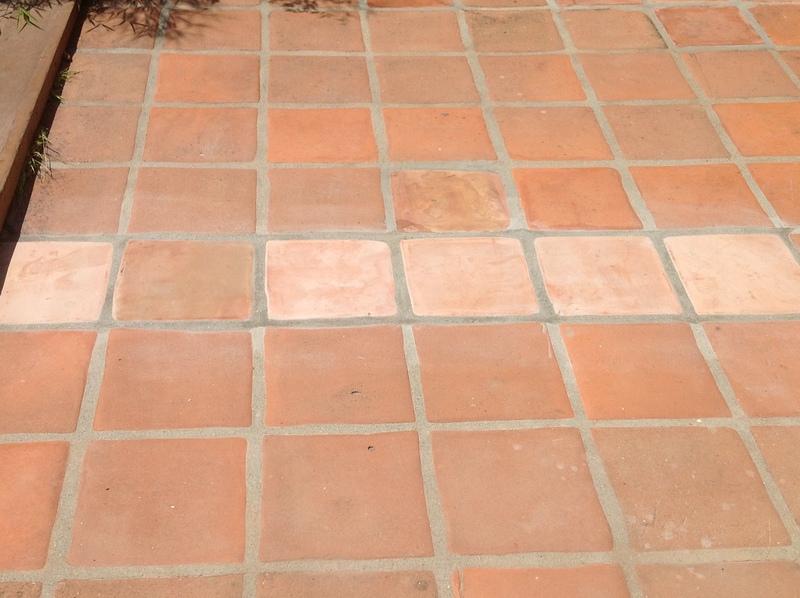 Two coat of Penetrating Sealer made these pavers water tight, and ready for the customer to enjoy once again. California Tile Restoration strips, cleans, and seals pavers all throughout the bay area in counties and cities such as Capitola, Scotts Valley, Watsonville, Salinas, Santa Cruz County, Alameda, Contra Costa, Marin County, Monterey County, Napa County, San Francisco County, Sacramento County, San Mateo County, Santa Clar County, Sonoma County, Solano County, Oakland, Gold Country, East Bay. North Bay, San francisco peninsula, San Francisco Bay Area, Wine country, Silicone Valley, South Bay, Santa Clara Valley, San Joaquin Valley, East Bay. Pavers Stained in Central California, Eastern California, Mount Shasta, Greater Sacramento Area, North Coast, Calistoga, Yountville, Napa, Atherton, Belmont, Brisbane, Daly City, Colma, San Mateo, Burlingame, Half Moon Bay, Palo Alto, Portola Valley, San Bruno, Foster City, Woodside, San Carlos, South San Francisco, Redwood City, Menlo Park, Millbrae, Pacifica, San Jose, Aptos, Mountain View, Saratoga, Sunnyvale, Morgan Hill, Milpitas, Monte Sureno, Los Gatos, Los Altos, Los Altos Hills, Gillroy, Cupertino, Campbell, Carmel by the sea, Del Ray Oaks. Matching tecates in seaside, Solidad, Pacific Grove. Marina, San City, King City, Green Field, Gonzalez, Loyalton, Angels Camp, Sierra County, Del Norte, Crescent City, El Dorado County, Placerville, South Lake Tahoe, Ross, Kentfield, Belvedere, Mill Valley, San Rafael, Tiburon, Marinwood, Lucas Valley, Danville, Lafayette, Moraga, Alamo, Orinda, San Ramon, Walnut Creek, Pacheco. CTR travels all throughout CA.